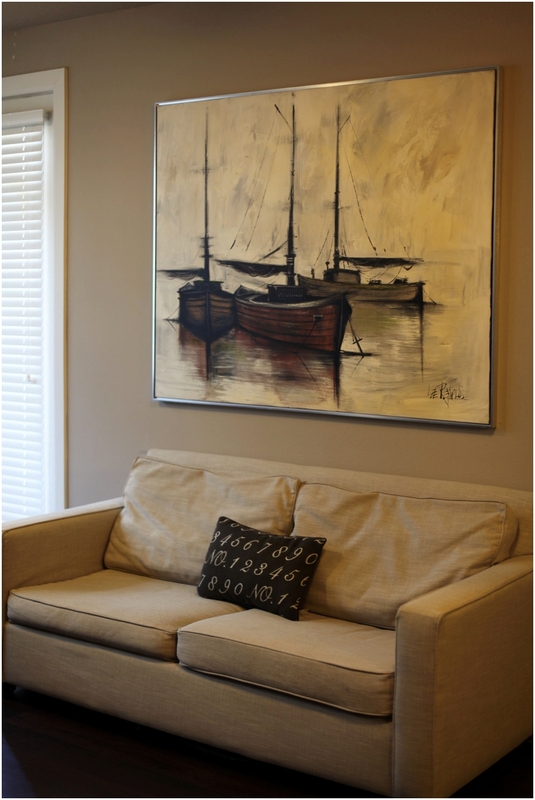 John and I are planning to change up our living room decor soon because we need a change but I must say, I’ve really enjoyed this particular living room design. We have a few modern pieces, a few vintage pieces, and just the right amount of weird and whimsy. I love our candle from R. Nichols. 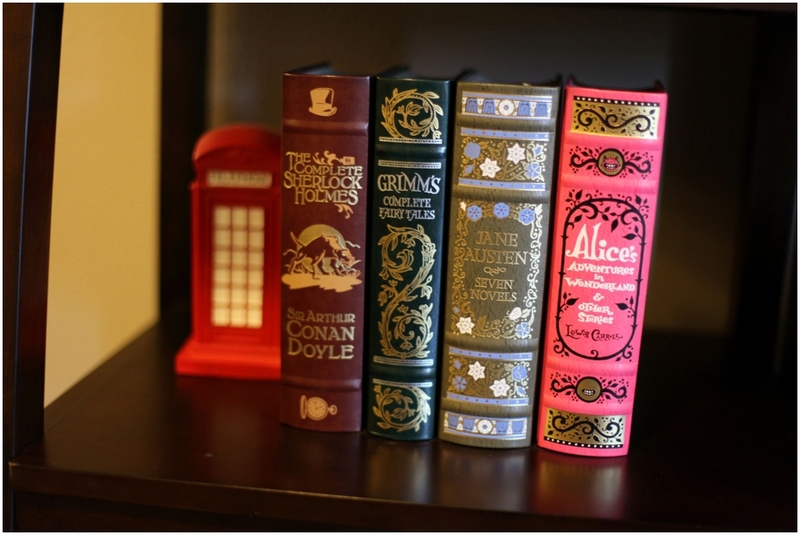 The book design is adorable and it smells fantastic! 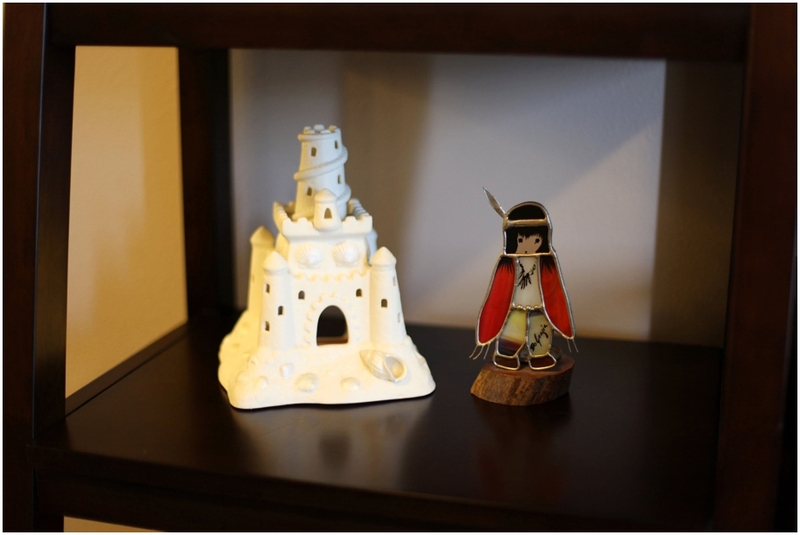 The castle and Native American votive are from my grandparents. 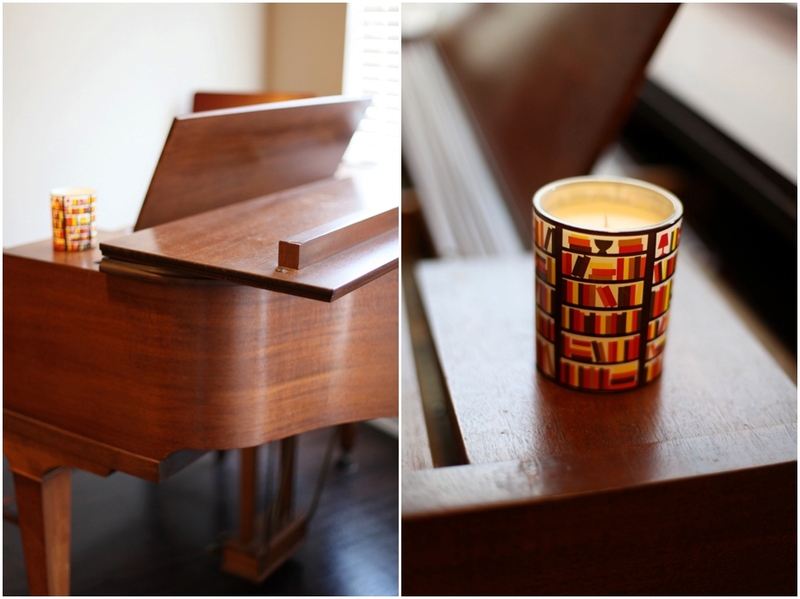 These are two of my favorite things in our home. 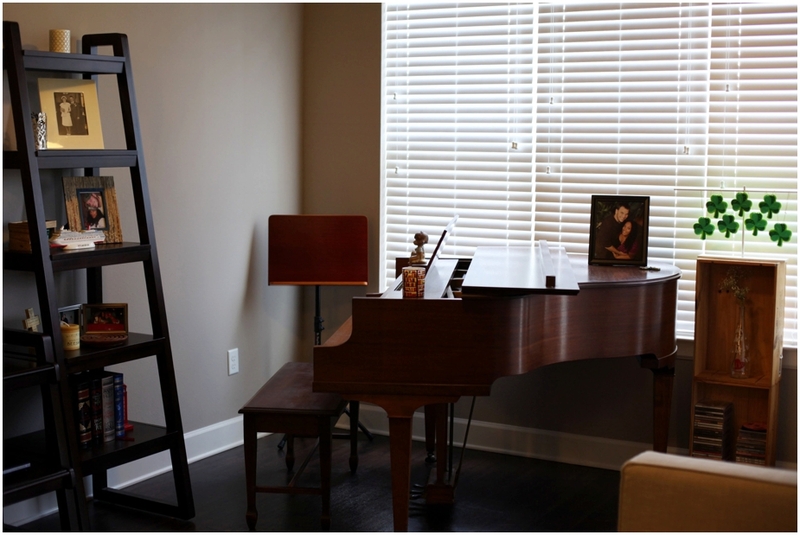 I like having books in every single room! It makes me feel safe. 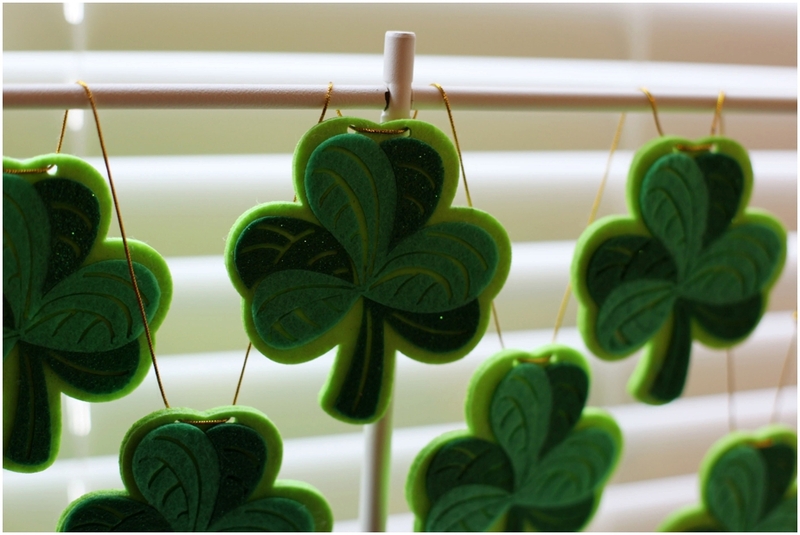 You’ll notice that there are shamrocks throughout our home. It should come as no surprise since I’m an O’Keefe! 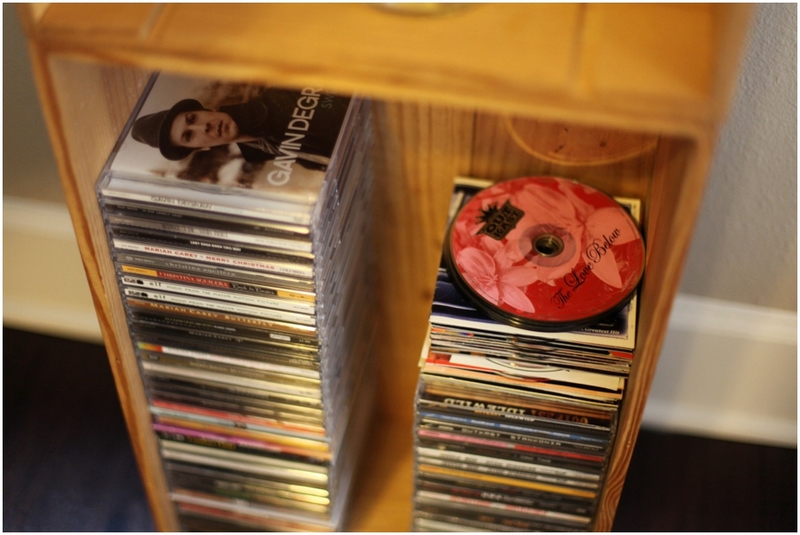 What’s left of our massive CD collection. There were some that we just couldn’t part with. We display them in old wine crates. This painting is from my Grandfather and it is my most prized possession. 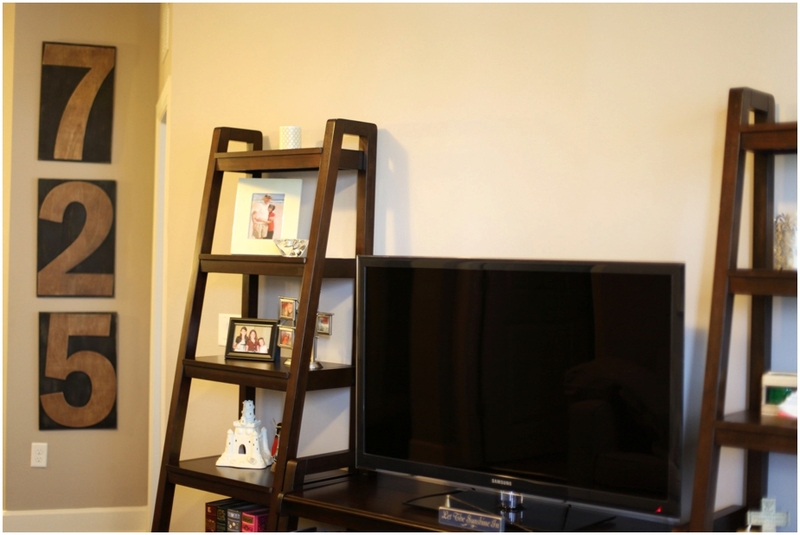 I hope you enjoyed this mini tour of our little living room. In elementary school, I didn’t realize that O’Keefe wasn’t my last name. I wrote it on all my papers along with Carter and my teachers never corrected me. Looking back, I realize that they obviously knew my father wasn’t in the picture considering my mother was incredibly involved at my school and they had never met my father. I didn’t yet have any disdain for my father’s name – that would come later. I also didn’t give much thought to writing his last name on my papers. It wasn’t until the end of elementary school when we got into standardized testing that I realized writing O’Keefe on my papers was no longer an option. By the time I entered middle school, I decided I no longer wanted to have my father’s last name and I would prefer to have my mother’s. I asked my mother if I could change it but she was apprehensive. I felt betrayed. I realize now that she probably hoped my father would step up to the plate and be a better parent. I’m sure she thought changing my last name would cause an argument and possibly make him even worse at being present in my life. At the end of the day, she’s a single mother who was trying the best she could to give me the closest things to a two parent household that she could. In high school, I started to hate my last name. Almost all of my cousins shared a last name that I didn’t. Even those in my family with a different last name had someone else to share it with. I was the only Carter in my family and in my life. It felt isolating. It was already challenging enough being one of the few people of color in my family (and the oldest one at that time). In all fairness, my family has never made me feel different because I look different than they do. They have been supportive, loving, and kind my entire life. However, that doesn’t change the fact that there are certain things they couldn’t help prepare me for as a person of color. There were also things about being black in America that I knew that they just simply couldn’t relate to. Not sharing their last name only made me feel more alone. I decided that when I turned 18 I would save up some money and legally change my name. I can’t honestly say I believe in love at first site because logically it doesn’t make any sense but here we are! John and I exchanged “I Love Yous” within in the first week of dating and I knew that we would end up married. 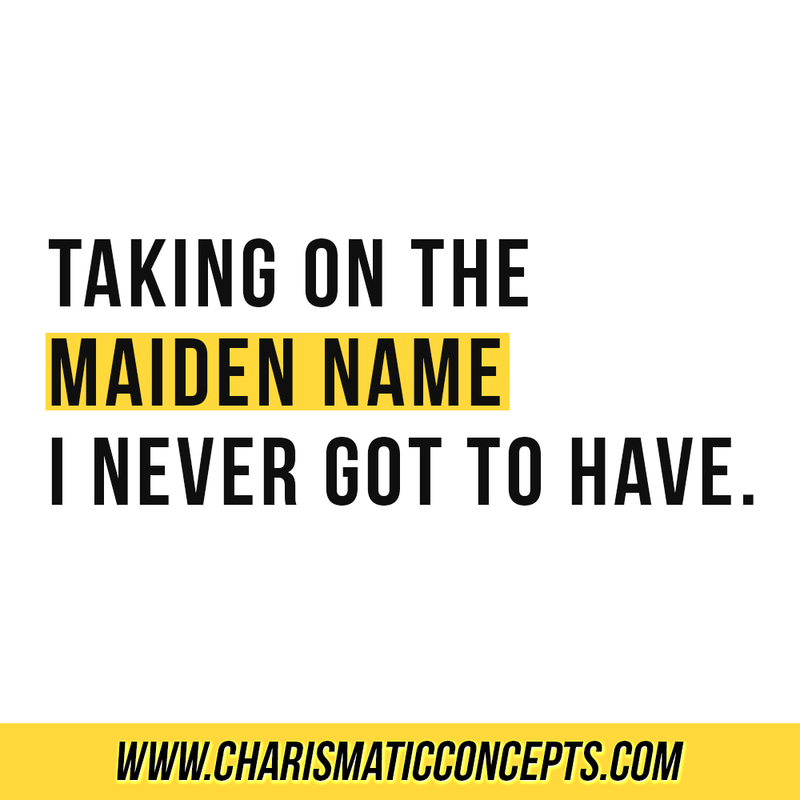 Even though I wasn’t ready to get married until almost four years later, the promise of a new last name kept me from changing my current one. Coincidently, John wasn’t a huge fan of his own last name. He was also carrying the last name of an absent father, and even worse, his was abusive. We discussed the possibility of picking a new last name or taking a family name as a last name around the time of our wedding. 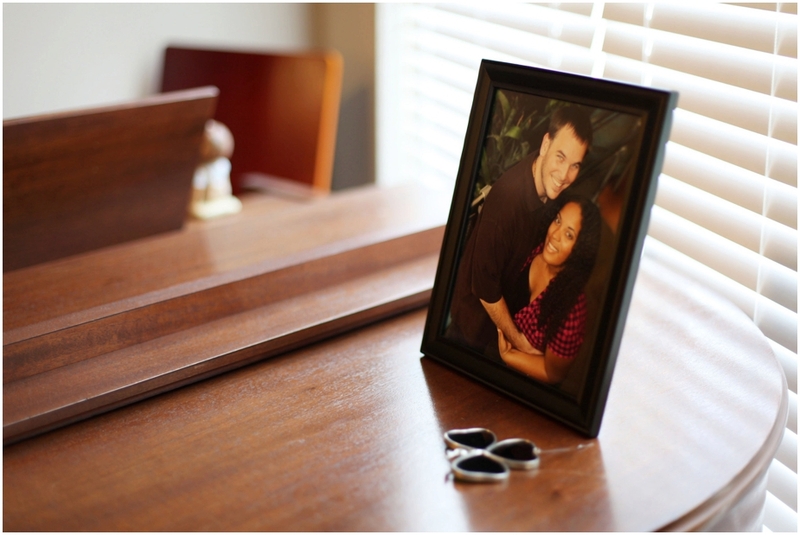 I changed my last name to his during the first year of my marriage because it was easy to do and convenient. It also was extremely cheap compared to the price to change it for reasons not related to marriage. I always figured we would decide on our new last name that first year. However, life got in the way and almost seven years later, we still hadn’t gotten around to doing so. John and I have a pact that we will not have children until I am out of my 20’s. As we get closer and closer to that day, I’m trying to prepare the best I can for what is to come. We may or may not try to have one biological child but we are definitely planning to adopt at least two children. This makes my preparation to be a parent a little bit different than the average parent’s. Only John, his mother, and I share the last name Moran. I wonder how my children will feel about being in a large extended family who has a different last name than theirs. While they may not mind at all, I think that giving them the last name O’Keefe provides them with an opportunity to share a last name with 60+ people who will instantly love and support them. This idea makes my heart happy. Over the past year, I’ve felt a strong pull to the name O’Keefe. Stronger than I have felt my entire life. I lost my grandfather in 2014 and the grief that I experienced afterwards was sometimes debilitating. I found that just hearing the name O’Keefe out loud would sometimes make me feel closer to my grandparents. When I brought up the idea of a last name change to John, he immediately was on board. I instantly felt a sense of relief. 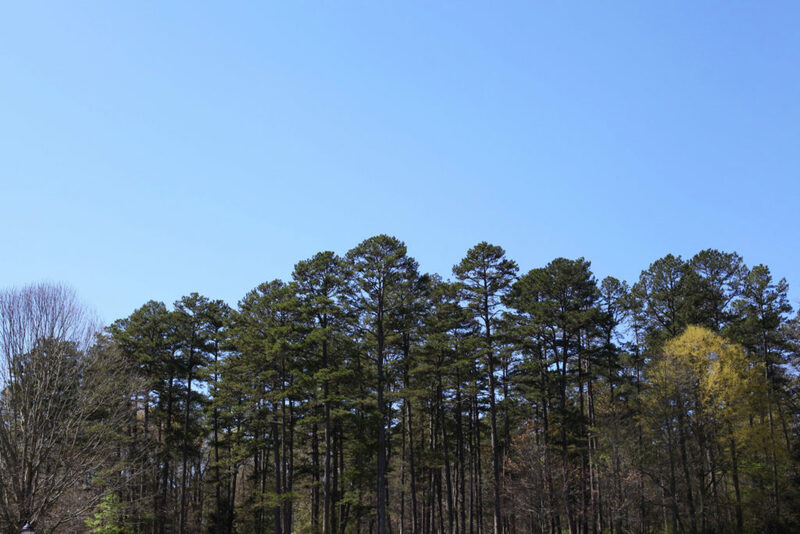 It felt like my grief was a weight on my chest and suddenly, most of it was lifted. It felt good to be able to do something to honor them. We knew immediately that we wanted to take on both O’Keefe and Ambroson (his grandparent’s last name). Our grandparents helped raise us and shaped us into the people we are today. Even though all four of them are no longer with us, they continue to positively influence our lives in a major way. We discussed a lot of different options, including hyphenation. In the end we decided that we would take on both last names, sans hyphenation but use O’Keefe as our last name so that we can share it with the rest of our family. Since John’s side of the family is just him and his mother, she is going to be changing her maiden name back to Ambroson and we will still share a name with her. It’s unconventional to change your last name almost seven years into marriage and even more so to have your husband take on the maiden name that you never got to have but for us, it works. Every marriage, every relationship, and every family is different and what some would never consider, others find to be a perfect fit. John and I have thought about this for a long time and we are both so excited to finally be honoring our grandparents this way and putting together the pieces of a future for our children that we are both proud of. Morning routines are not one size fits all. What works for some creatives simply won’t work for others. 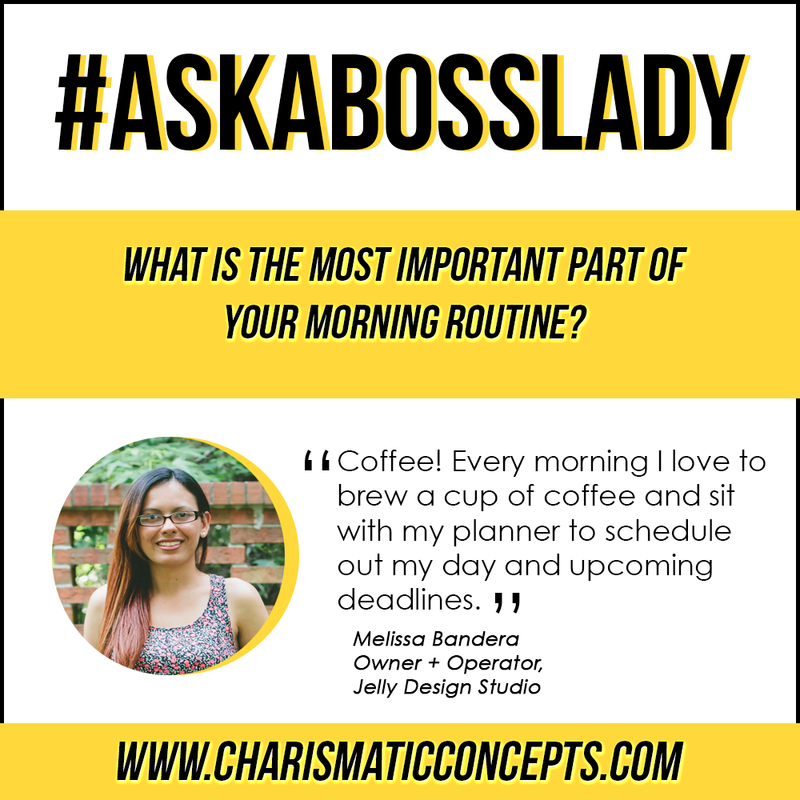 But running a business means you need to find a morning routine that helps you feel happy, creative, and productive throughout the day. 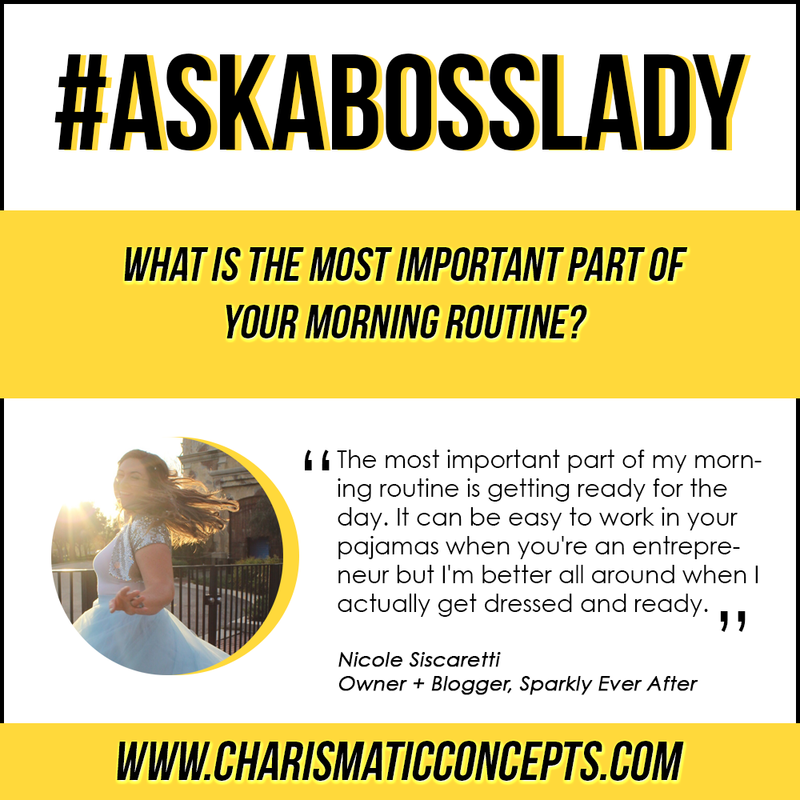 Having a helpful and efficient morning routine doesn’t need to be time consuming and complicated. 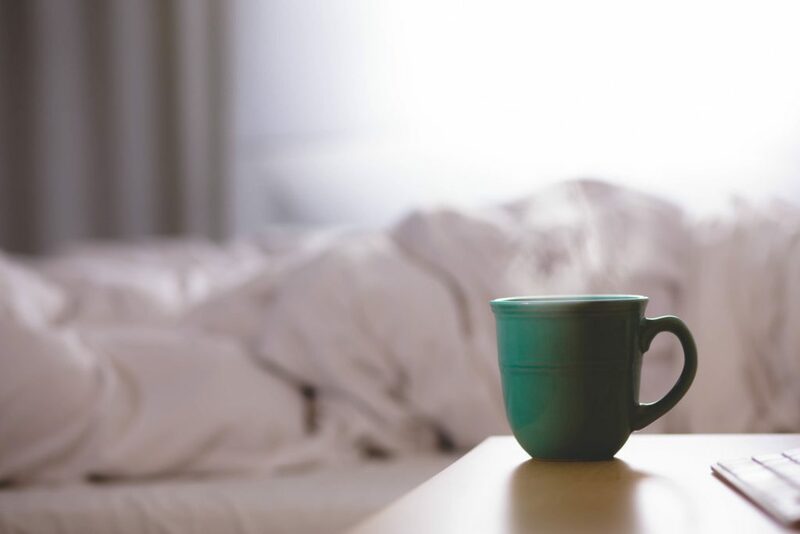 Just adding the following four activities to your morning routine can have huge benefits. Drinking water first thing in the morning re-hydrates you from the overnight fast you experience while sleeping . When you drink water on an empty stomach it helps purify your colon and makes it easier to absorb nutrients. It also boosts your metabolism, flushes out toxins, and improves brain function so drink up! You’ve heard time and time again that it is the most important meal of the day and that is because it’s true. Eating a healthy breakfast (especially one high in protein and fiber) gives you energy and helps you make healthier decisions throughout the rest of your day. Ever feel like your mind is cloudy in the morning? Eating breakfast restores your glucose levels which are essential for the brain to function properly. Studies have shown that people who eat breakfast also have an easier time maintaining their weight. Anytime that you lay mostly still for six to eight hours, you are going to be a little stiff afterwards. Just five to ten minutes of stretching in the morning can help ease your sore joints and muscles. Improved posture and blood flow are also benefits of early morning stretching. If you want to increase your focus and sharpen your senses then adequate blood flow is important. 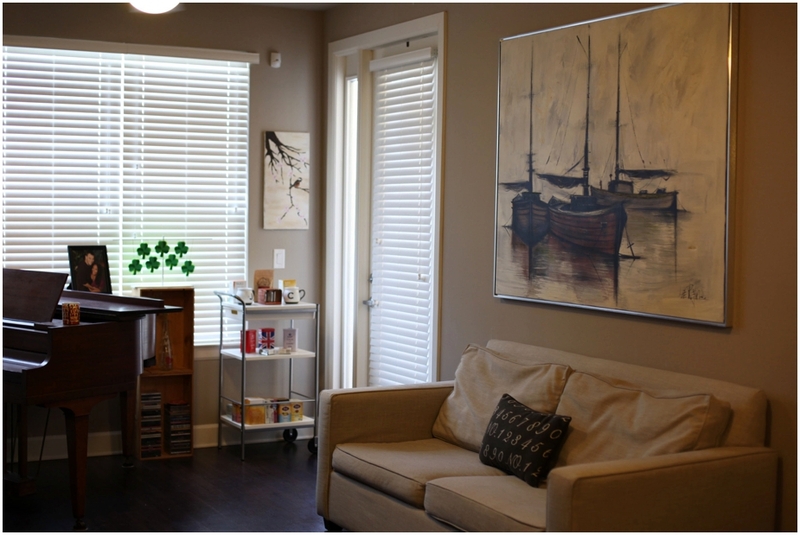 Stretching in the AM can also fight lethargy and provide you with more energy. Master a few yoga poses and make them a part of your morning routine. Many of us wake up at the last possible minute, drag ourselves out of bed, and reluctantly get ready to work. Why not wake up five minutes early and take a few quiet moments in the morning to focus on what you are grateful for. Remembering all of the wonderful people, ideas, places, and things in your life first thing in the morning is a wonderful way to feel more thankful throughout the entire day. This week was a busy one! On Monday I did a photo shoot for Mint + Whimsy Studios. On Tuesday I recorded a new episode of the Heart and Hustle podcast with Angelica. Wednesday and Thursday were spent working with vendors for Equal and Forever and today I have three meetings with creative entrepreneurs whom I’m consulting for. John and I have dinner plans with friends tonight, Disney plans on Saturday, and Tampa plans on Sunday! So the weekend will be equally as busy and rewarding. I hope your days have been jam-packed with things you love and your weekend leaves you feeling creative and inspired. ⚡ Caribbean artist celebrates her heritage by reimagining Disney princesses. ⚡ Artist due “Expanded Eye” explore human consciousness through painted repurposed wood assemblages. ⚡ Secrets for entrepreneurs on being productive from anywhere in the world. ⚡ 12 qualities of self-made millionaires. ⚡ 18 reasons that you shouldn’t create an online course. ⚡ Here’s how to make a living blogging. ⚡ How Bryanda from Quirky, Brown Love grew her blog to 350,000 page views. ⚡ 4 things you should know before starting a blog. ⚡ Create a life routine that you love. ⚡ 15 super-easy self-care ideas for creative entrepreneurs. ⚡ 5 things Warren Buffet does after work. 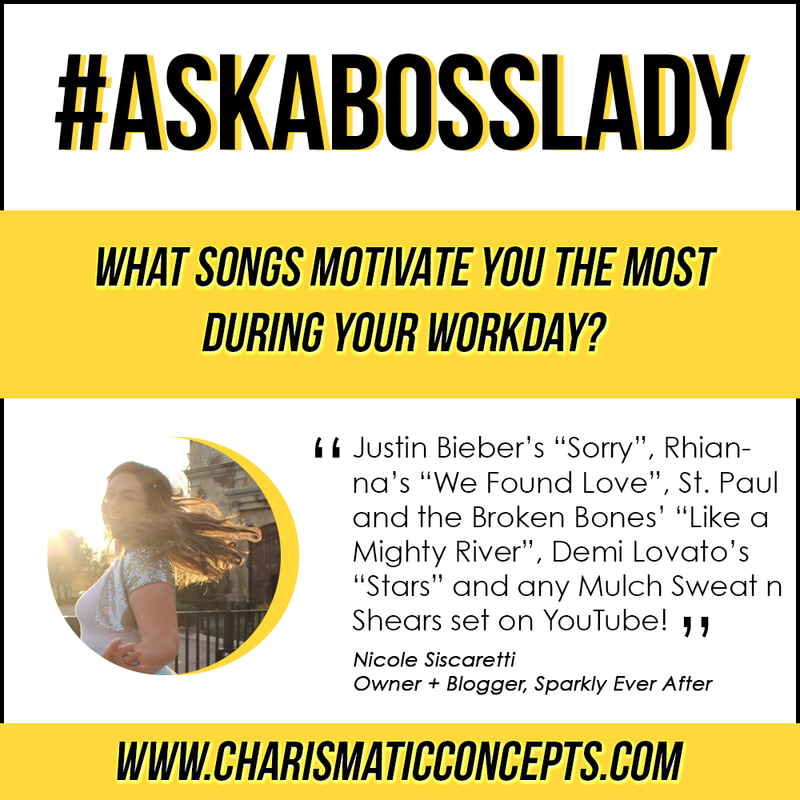 Ask A Boss Lady | What songs motivate you the most during the workday? 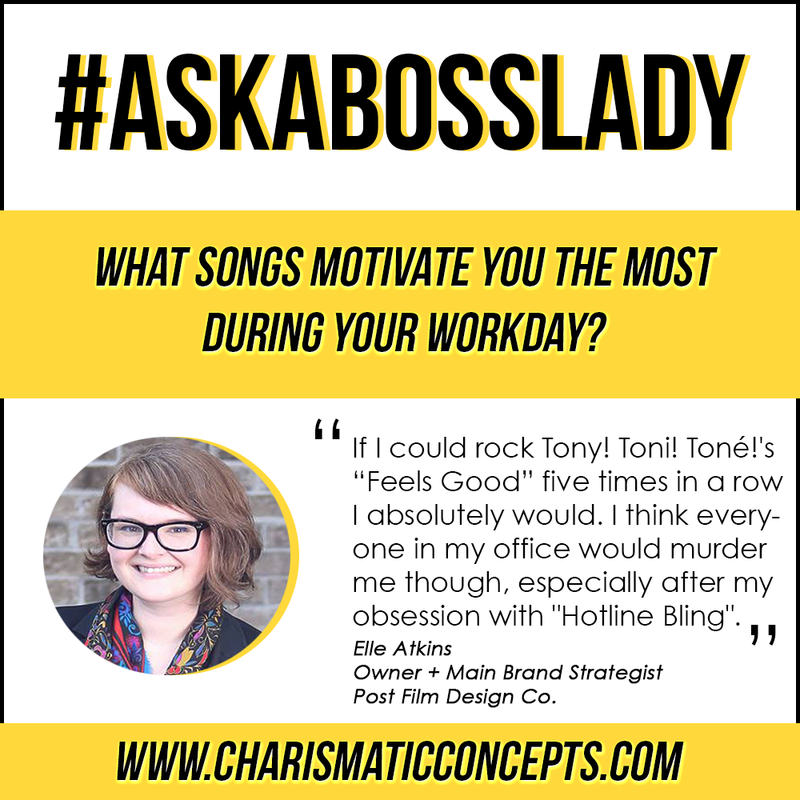 Every Tuesday I ask some of the best and brightest women business owners a question regarding their personal business, entrepreneurship, productivity, or creativity. 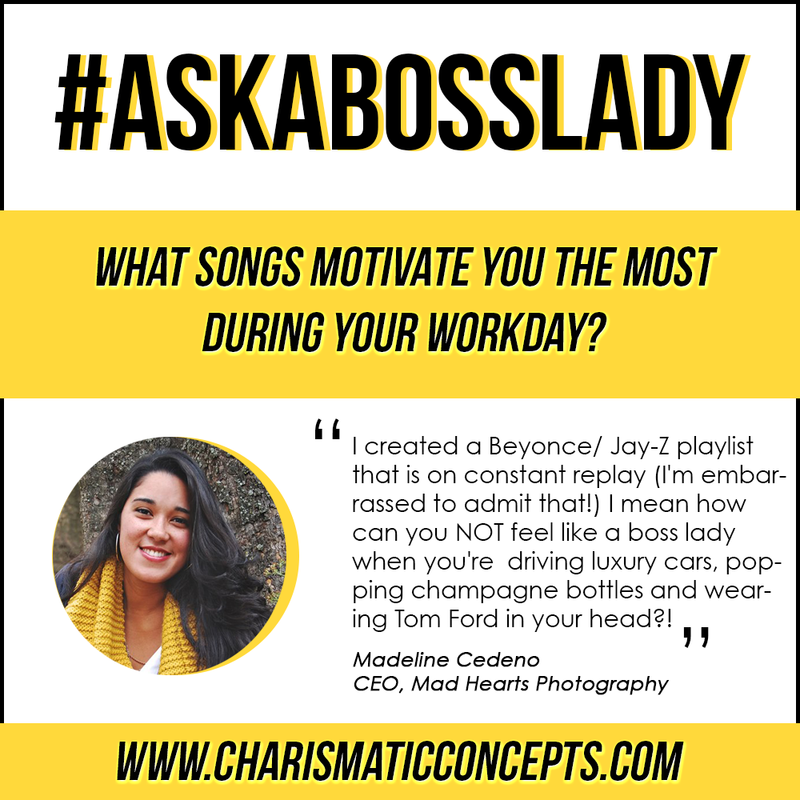 Check out their answers here on Tuesday morning and share your own using the hashtag #AskABossLady. I’ll be sure to share some of the most helpful answers on twitter for you. 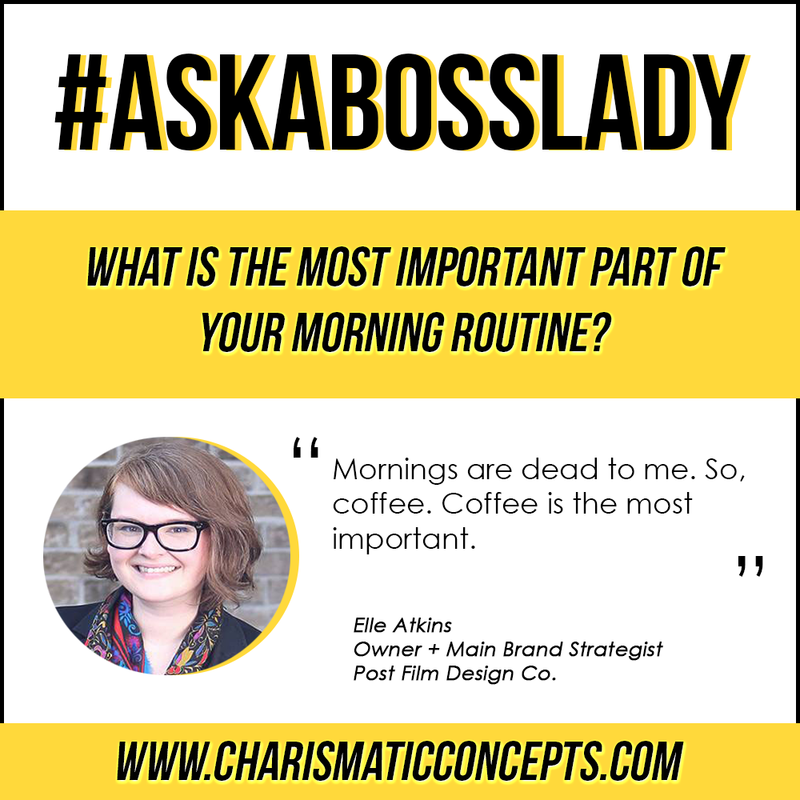 Ask A Boss Lady | What is the most important part of your morning routine?